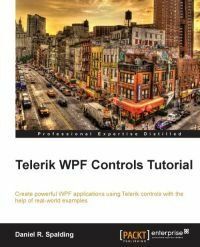 When I got a chance to review Daniel R. Spalding's book Telerik WPF Controls Tutorial published by Packt Publishing, I had my doubts about a book focusing solely on controls by a single vendor. As quite a proponent of using third party controls whenever it makes sense, I finally got curious and decided to go for it and get to know Telerik's WPF control suite better in the process. The book started out with a useful discussion in favor of using third party controls instead of customizing Microsoft's default ones yourself. Unfortunately this wasn't followed up with information I expected. I missed a lot of useful details that would help me decide whether to use these controls or not: their advantages in comparison to standard controls, which properties are bindable and which not, different options for getting the entered data back from controls, etc. I would much prefer more complex real world control usage scenarios instead of the really basic samples. Although the book is already really short, it still contains too much content, hardly related to Telerik controls. Instead of diving into their built-in validation support, the author focused on his own implementation. A lot of attention was given to loading the data for the controls from various sources. I would prefer the sample data just being there and having its structure explained in more detail instead of having to check the accompanying code for that. This content also felt very repetitive, appearing in each chapter with only minor differences. The whole section about authentication seemed completely out of place to me, as well. In my opinion this book is a big missed opportunity. What could have been a show case of designing great UI featuring Telerik's controls with recommended best practices and usage patterns, turned out to only be a shallow overview of a small subset of available controls, interspersed with random opinionated half accurate information. I can hardly recommend the book to anyone except maybe to beginners in WPF with no previous exposure to any third party controls, and even they could be better served elsewhere.